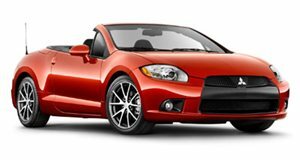 The Eclipse Spyder is a car at the end of its long life, and one that perhaps should have been taken off of life support some time ago. The Eclipse Spyder was the zenith of sports compact convertibles in the 90’s, and this is basically what it continues to be, a car that would be better-suited to the 90’s car market. Low power, serious torque steer and terrible interior all might have been ok fifteen years ago, but not so today. Similarly old-school is the way the Spyder’s chassis tend to flex when pushed hard. I isn’t particularly competitively priced either.